Inspired by motor sports, the Casio Edifice promises precision timing with a sports design. Crafted with a large stainless steel bracelet, this tough but elegant timepiece features a date display, stopwatch function, scratch resistant mineral glass and Neobrite coating to the indices. The Casio Edifice offers motor sport inspired timekeeping optimised for speed and precision. 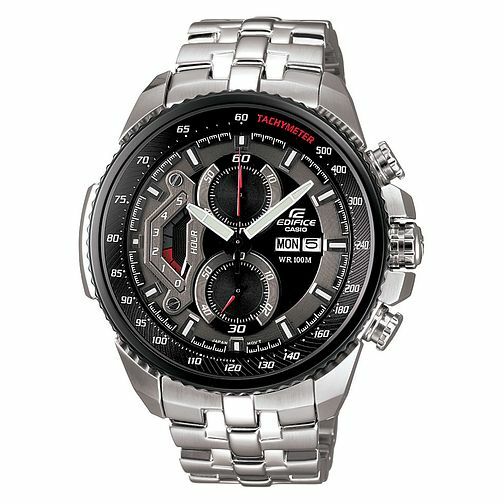 Casio Edifice men's stainless steel bracelet watch is rated 5.0 out of 5 by 1. Rated 5 out of 5 by Anonymous from Luxury watch for such a low price I had this watch about a year ago now from my mum... it is so fantastic in its time precision and durability. I happened many times to hit it against sharps things by accidents but it has never been scratched AT ALL! it really amazing and so fashionable. I would highly recommend it. It is really so cheap for its luxurious value!